One of the lovely things about this time of year is that reminders abound to express gratitude. I (Karin) recently came across an article on Aha!Parenting.com which brings together many of my favorite gratitude tradition ideas and has a few that are new to even this gratitude tradition collector! If you are looking for a gratitude activity or practice, the Aha! Parenting article has a nice collection. I also describe gratitude traditions on this website. If you are in the San Francisco Bay Area over the Thanksgiving Weekend, come visit with Lori and I at a book signing at The Multicultural Children’s Bookstore at The Shops at Hilltop in Richmond on Sunday, November 25, from 2:00 pm-5:00 pm. We are very much looking forward to talking with people about My Amazing Day. And we’ll have few activities related to its themes. The Multicultural Children’s Bookstore is a new treasure in our community with a bountiful collection of diverse books. More details on the book signing can be found on the Events page. May the gratitude experiences of this season spread into your whole year! You can participate in the discussions by searching for the hashtag #ReadYourWorld on Facebook, Twitter, and Instagram. 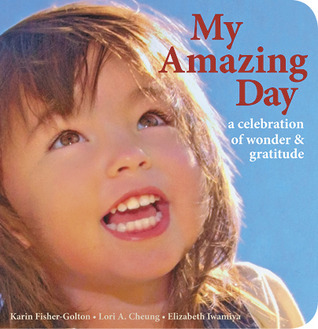 My Amazing Day and I (Karin) are participating in multiple ways this year. The Spain-based website bambolango shared a review in both Spanish and English. The review includes some nice activity ideas. This Facebook review is from an Australian reviewer who sells charming keepsake cards for babies’ first words via her Facebook page, WordsOfBub. I love what she said about how adults and toddlers might view My Amazing Day. Over at Books, Babies, and Bows, the blogger shares a review of My Amazing Day, which includes her 4-year-old daughter’s drawing in response to being asked what happened during her amazing day. All us reading fans will love her response. And at @Victors_Books on Instagram. Not only is there a review, but this awesome montage of photos from Victor’s own amazing day. I will be participating in Indie Author Day at the Berkeley Public Library this coming Saturday, October 8. Details are here: https://www.berkeleypubliclibrary.org/events/indie-author-day-central. I’ll be one of the “speed readers.” (Much easier when your book is only 101 words long! I plan to get through the whole thing and have time to say a little about its creation.) I also look forward to visiting with readers and signing books. Indie Author Day is a new event for readers and creators of independently published books. It will take place at libraries across North America. Here is general information about Indie Author Day: http://indieauthorday.com/. My lifetime of loving reading and children’s books began in the Berkeley Public Libraries. When I think of them, images of being in awe at the number of books…and possibilities, of looking through low shelves at eye level, of having a librarian figure out just the book I’d love to read come to mind. I am so pleased to get to participate there as an author. I am thoroughly delighted to announce that My Amazing Day was presented with the Bay Area Independent Publishers Association (BAIPA) Book Award for Fiction: Children’s Picture Book on December 12, 2015. BAIPA is a highly regarded organization devoted to elevating the art of publishing. Its membership draws from the wider San Francisco Bay Area and ranges from novices to well-established professionals. Karin has found her membership in this organization both highly beneficial and enjoyable. The BAIPA awards had not been given since 2013, so My Amazing Day was considered among a group of children’s books published between mid-2013 and mid-2015. A panel of judges evaluated the books for writing style, editorial standards, cover design, interior design, and marketability. A complete list of 2015 BAIPA Book Award winners is here.